1. Preheat the oven to 200˚C, gas mark 6. Heat the oil in a large frying pan over a medium heat. Add the onion, garlic, thyme and a pinch of salt and fry gently for 15-20 minutes, stirring occasionally and adding a splash of water if the onion starts to catch. Add the kale to the pan and continue to fry for 5 minutes, until the kale has wilted and the onions are meltingly soft. Remove from the heat and set aside. 2. Line a flat baking sheet with baking parchment and unroll the puff pastry sheet onto it. Using a sharp knife, score a rectangle about 2cm from the edge. Prick all over the inside of the rectangle with a fork and brush the border with the milk. 3. Spread the onion and kale mixture over the pastry, leaving the border clear. 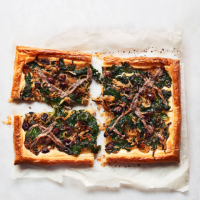 Arrange the anchovies in a lattice pattern on top and scatter over the olives. Bake for 15 minutes, until the pastry is golden and crisp. Serve immediately, or at room temperature, with a green salad, if liked.